Owners of popular "standard" bikes, such as Honda's 599/919 and Suzuki's SV650/SV1000, have been asking for full-coverage wind and weather protection. But since today's "standards" offer near superbike power and handling, riders demanded a windshield that offered looks and performance to match their bike. Answering the call, National Cycle proudly offers the Plexifairing GT™. 1 Slight trimming needed for radiator clearance. 2 Lower mounting rods may need to be cut to allow clearance. 3 Requires BAG#77 for 1.00" handlebars. The Plexifairing GT™ adds sporting performance to National Cycle's legendary Plexifairing and Plexistar shields. These modern day classics revolutionized motorcycle windshields more than 25 years ago. 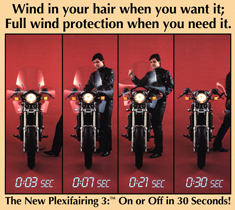 Like its predecessors, the Plexifairing GT offers outstanding style, great value, and easy installation. There is also full protection for the rider's head, hands, torso and thighs. An updated, sporting design offers a level of wind protection that meets and exceeds even top-of-the-line touring bikes. Ingenious lower wind deflectors noticeably cut down turbulence, noise and buffeting behind the shield. The Plexifairing GT features National Cycle's patented QuickSet™ Mounting Hardware for quick and easy no-tool installation, adjustment and 10-second removal. Illustration at left depicts relative, comparative profiles of the Plexifairing 3, Plexifairing GT and Plexistar 2. 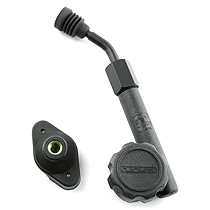 The Plexifairing™ was the world's first quick release windshield, thanks to our patented QuickSet™ Mounting Hardware. This same mounting system is used on the Plexifairing's sport-oriented counterpart, the Plexifairing GT™. 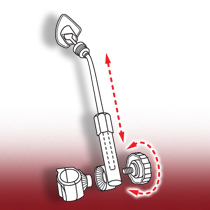 QuickSet Hardware is designed for durability, ease of installation and hassle-free removal. It permits 10-second windshield removal, and complete fairing removal in under 1 minute. The QuickSet system incorporates our No-Hole Ballsocket™ technology, which means there are no drill holes in the fairing that can produce stress cracks after hard use. The Plexifairing GT™ is constructed from 4.5mm thick, DOT approved High Impact Acrylic. It also incorporates our patented No-Hole Ballsocket™ technology and QuickSet™ Hardware System.